TRANSLATION : C.Seidler. ORIGIN : Germany. CLASSIFICATION F.CJ. : Group 5 Spitz and primitive types. 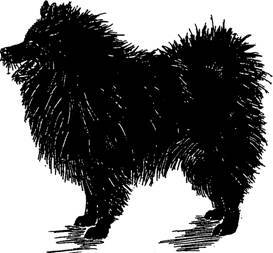 Section 4 European Spitz. Without working trial. 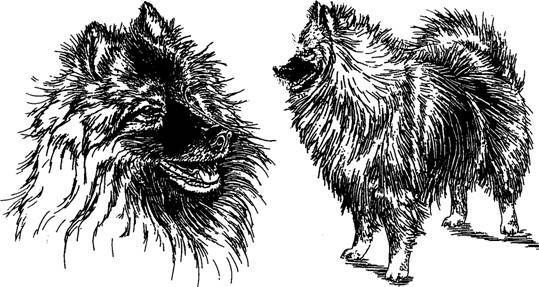 BRIEF HISTORICAL SUMMARY : German Spitz are descendants of the stone age «Peat Dogs» (Torfhund) «Canis familiaris palustris Riithimeyer» and the later Lake Dweller's (Pfahlbau) Spitz; they are the oldest breed of dog in Central Europe. Numerous other breeds have been produced from them. 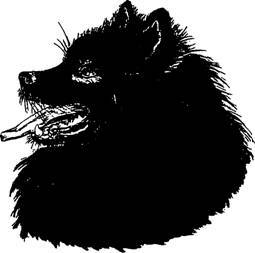 In non-German speaking countries Wolfsspitz are known as Keeshonds and Toy Spitz as Pomeranians. BEHAVIOUR AND CHARACTER : The German Spitz is always attentive, lively and exceptionally devoted to his owner. He is very teachable and easy to train. His distrust to strangers and lack of hunting instinct make him the ideal watchdog for home and farm. He is neither timid nor aggressive. Indifference to weather, robustness and longevity are his most outstanding attributes. CRANIAL REGION : The Spitz's medium size head, seen from above, appears broadest at the back and tapers in wedgeshape to thi tip of the nose. Stop : Moderate to marked, never abrupt. square to the jaws. Pincer-bite is permissible in all varieties of Spitz. Cheeks : The cheeks are gently rounded, not protruding. only a slight tuck up. firmly connected to the brisket. in all shades of colour, but dark brown in brown dogs. turned neither in nor out in movement. 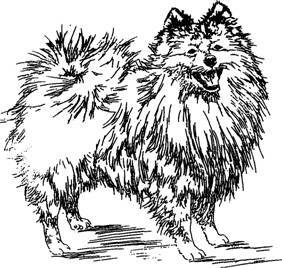 HAIR : The German Spitz has a double coat: Long, straight, stand off top coat and short, thick, cotton-wool-like undercoat. Head, ears, front side of front and hind legs and the feet are covered by short, thick (velvety) hair. The rest of the body has a long rich coat. Not wavy, curly or corded, not parted on the back. Neck and shoulders are covered by a thick mane. The backside of the front legs is well feathered, the hind legs have ample feathering from croup to hocks. The tail is bushy. the toes; black tip of tail; underside of tail and trousers pale silver grey.